A1 Group Training have a range of Transport and Logistics Short Courses available to participants. There is no set commencement date for these types of courses as they commence at a time to suit participants’ availability. ​To enrol in any of our Short Courses you will need a Unique Student Identification number (USI). You cannot be issued with a Certificate or Statement of Attainment unless you have a USI. ​You can create your own USI by visiting www.usi.gov.au. Or authorise A1 Group Training to create one on your behalf. ​All of the single units of competency listed below are from the TLI Training Package. They are suitable for candidates who are working in logistic or transport Industries. Candidates gain the skills and knowledge required to work safely in accordance with relevant state/territory roads and traffic authority regulations/permit requirements. The short courses are available by completing the full course or through Recognition of Prior Knowledge (RPL). Only experienced operators can apply for RPL. Candidates completing the full course are provided with face-to-face knowledge training as well as practical hands-on-training using the machinery and equipment in a work environment. This unit involves the skills and knowledge required to identify, apply and follow chain of responsibility legislation, regulations and workplace procedures in relation to heavy vehicles as they apply to an individual’s own job role. No licensing, legislative or certification requirements apply to this unit at the time of publication. Explaining the chain of responsibility features, applying the requirements, and identifying and reporting breaches in the Heavy Vehicle National Law (HVNL) and regulations or applicable state/territory law and regulations. Work is performed under some supervision, generally within a team environment. ​This unit involves the skills and knowledge required to conduct weighbridge operations in accordance with regulatory requirements and workplace procedures, within the transport and logistics industry. Work is performed under some supervision, generally within a team environment. No licensing, legislative or certification requirements apply to this unit at the time of publication. setting up for weighbridge operations, weighing loaded and unloaded vehicles, finalising weighbridge operations, and completing required records and documentation. workplace procedures for conducting weighbridge operations. ​This unit involves the skills and knowledge required to apply fatigue management strategies within the transport and logistics industry. Work is undertaken in compliance with relevant legislation, regulations, codes and guidelines. Work is performed under some supervision generally within a team environment. No licensing, legislative or certification requirements apply to this unit at the time of publication. Identifying and acting on signs of fatigue and implementing appropriate strategies to minimise fatigue during work activities, in particular when operating equipment, trains, vehicles, load shifting equipment, marine vessels and aircraft. workplace policies and procedures related to fatigue management and the control of factors that can contribute to fatigue and fatigue-related accidents. ​This unit involves the skills and knowledge required to administer the implementation of fatigue management strategies during work operations in a defined workplace in accordance with national and state/territory legislation and relevant regulations. Work is performed under limited supervision generally as a team leader or supervisor. No licensing, legislative or certification requirements apply to this unit at the time of publication. Monitoring the implementation of fatigue management strategies, recognising breaches of fatigue management policies, procedures and regulations, and developing and assessing staff competence in fatigue management. It also includes providing feedback to staff on shortcomings in their fatigue management skills and knowledge, and reporting to management on the implementation of fatigue management policy. This unit involves the skills and knowledge required to load and unload goods and cargo in accordance with relevant state/territory roads and traffic authority regulations/permit requirements. Work is performed under general supervision within a team environment.No licensing, legislative or certification requirements apply to this unit at the time of publication. Loading and unloading goods and cargo, securing and protecting a load and completing all required documentation. workplace procedures and policies for loading and unloading goods/cargo. This unit involves the skills and knowledge required to secure cargo in accordance with procedures and regulatory requirements as part of work activities within the transport and logistics industry. Work is performed under some supervision generally within a team environment. No licensing, legislative or certification requirements apply to this unit at the time of publication. Preparing to secure cargo/containers, lashing and unlashing cargo, protecting cargo from weather, and packing and unpacking cargo. This unit involves the skills and knowledge required to follow and apply work health and safety (WHS)/occupational health and safety (OHS) procedures when carrying out work activities in compliance with the relevant WHS/OHS regulations and procedures. Work is performed under some supervision generally within a team environment. It involves applying established WHS/OHS and hazard minimisation principles and procedures to conduct workplace activities. No licensing, legislative or certification requirements apply to this unit at the time of publication. Following workplace procedures for hazard identification and risk control, contributing to WHS/OHS management arrangements and completing WHS/OHS records. WHS/OHS warning signs and signals. ​This unit involves the skills and knowledge required to operate a container side lifter (swing lifter, side loader) in accordance with relevant state/territory authority requirements and regulations. 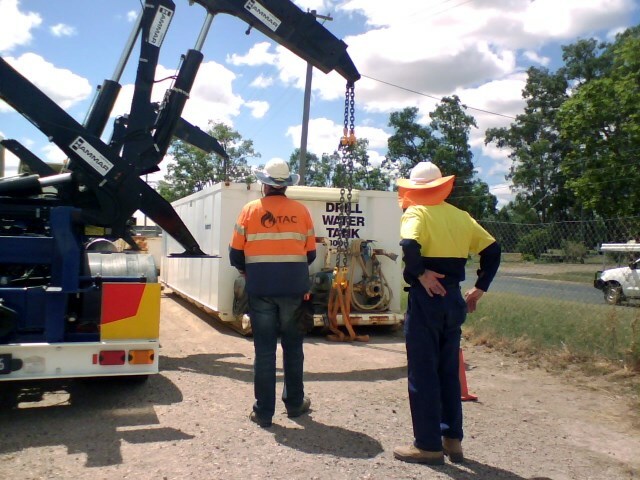 Operation of a container side lifter is performed with limited supervision, and with duty of care responsibility for self and others in achieving the prescribed outcomes. No licensing, legislative or certification requirements apply to this unit at the time of publication. Loading a container from the ground onto a vehicle, unloading a container from vehicle to ground, and transferring a container from one vehicle to another. It also includes maintaining systematic and efficient control of all functions, managing side lifter condition and performance, and effectively managing hazardous situations while operating a container side lifter.